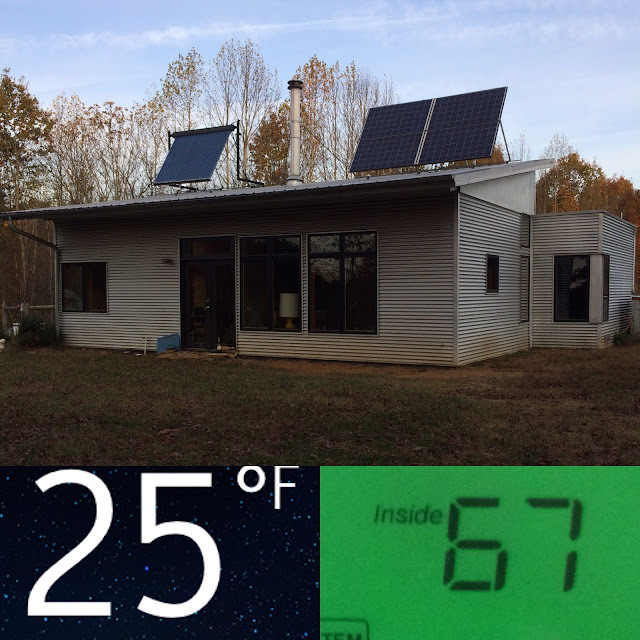 Temperatures at the modern off grid prefab passive solar house are now traditionally seasonal- in the 20s at night, 50s or low 60s midday. 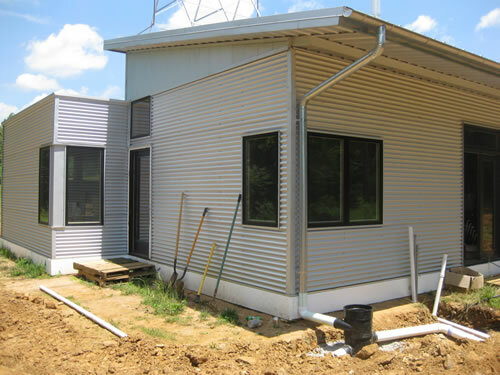 Each winter I spot check the off grid prefab's energy efficiency- to see if there is any change in the prefab's performance. you wake to 25, but with no heat on yet the offgrid SIP prefab is 67.
comfy in short sleeved pjs sipping coffee... GOOD MORNIN'. It is always so comfortable in the off grid modern prefab, even without heat when we wake, that we forget just how cold it is, outside. Here the canines are with their favorite rope bone one morning this week. If you look closely you can see that the rope bone is FROZEN SOLID. It was hilarious to see them tussle over who had the (frozen stiff) rope bone- whoever had it in their mouth dropped it quickly as they realized HOW COLD it was! Rope bone frozen in an "S" shape! We did have one maintenance issue at the off grid prefab house this year. It would rain, and no matter how much I scrubbed the filter of our rainwater collection system, it just didn't seem to be nearly as efficient. Phone calls to the company confirmed something was amiss- "You really only need to wash the filter every six months or so..." "Did you check if there was settling of the home site? That could cause things to be askew..." No, no settling of our home site, the filter was scrubbed clean... yet every time we had a downpour, I opened the lid, looked down and yep, the rainwater was gushing through but you could see that the system was not performing as it used to. Rainwater Management Solutions is so invested in their product they were going to send their president down to our little town o' fourty to see what was going on. THANKFULLY, Handsome Husband beat him to it and solved the issue that perplexed me for months. It rained, the system performed beautifully and efficiently once again. "WHAT DID YOU DO???" He smiled and gently suggested that if this ever happens again, don't just clean the filter, but also everything around it. OHHHHHHHHHH. 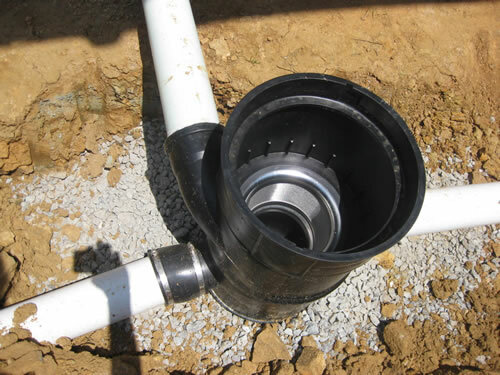 Years later, I can not recommend Rainwater Management Solutions, their products, and their staff enough. 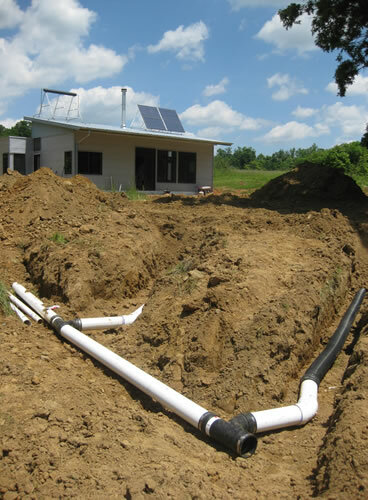 We have been extremely pleased with their rainwater harvesting and collection system, and their staff is fantastic. but around it (black part). Obligatory "I Voted" pic! Never goes outta style! Do you know what's interesting? In Virginia, candidates who won from all parties- Democrats -and- Republicans- had the environment / clean air and water as a platform. Those who didn't? Didn't get elected. This is so important with what is currently going on at the EPA: ALL THE CANDIDATES WHO WON, HAD CLEAR, PRO-ENVIRONMENT PLATFORMS. Three things: Clean Air, Clean Water & Open Spaces"
He listed on his site that he was not only pro-environment but used the word PROTECTOR. Halifax County Sportsman’s Club Conservationist of the Year Award"
As I type, a PRIVATE pipeline is suing hundreds of private landowners for their legally-owned land, their well-funded lobbyists and lawyers muscling through the courts to condemn family farms for their profit. Environmentalists of BOTH parties need to work together to prevent another private business from taking eminent domain over citizens for their own profits while also wrecking shared community public resources. "Thou Shalt Not Covet Your Neighbor's..."
"The benefit the Mountain Valley Pipeline would bring to those living along its 303-mile route is a point of intense disagreement and opinion does not cut neatly along partisan lines. There are local tea party leaders and Trump enthusiasts who revile the plan, and die-hard Democrats who see it as salvation. Critics, including several national environmental organizations, say the benefits won’t be reaped by residents along the route, but by investors angling for a windfall. Those investors are permitted to collect an impressive 15% return on the project under federal rules left over from a time when domestic gas was not so plentiful and policies were designed to aggressively promote its discovery." "Opposition to the Mountain Valley Pipeline and to the separate-but-similar Atlantic Coast Pipeline to the north has focused both on environmental issues and the protection of private property rights, sometimes creating unique alliances of environmentalists and conservative Republicans. Lugar said the concerns about private property rights should be disquieting for everyone. something that is not theirs??? "...controversial fracked gas pipelines, that, according to recent estimates, will produce greenhouse gases equivalent to that produced by 45 coal fired plants or 158 million metric tons per year, more than doubling Virginia’s carbon footprint. While pipeline opposition continues to grow, the legal terrain has shifted dramatically. In August, two federal appeals courts issued landmark decisions that make it much more difficult for these pipelines to survive judicial scrutiny. First, the United States Court of Appeals for the Second Circuit reaffirmed that states in fact have the power to stop pipeline development. The decision came in a case challenging a decision by New York Governor Andrew Cuomo’s environmental regulators rejecting certification of the $1 billion Constitution Pipeline. Cuomo’s appointees took all of 14 pages to stop the pipeline and their decision was upheld by the court." The week was filled with friends, but also a loss. R.I. P. Tiny's Arch Nemesis. Tiny still waits, eyes studying the oak, for your war cry, chase, and dash beyond the fenceline. Over the weekend, one of my favorite friends, Miz L., came out from the city to pay us a visit! After a heady Ladies Lunch, I took her hiking on the High Bridge Trail. Our favorite moment was standing still on the bridge, listening to the silence... then the slow gathering of wind, channeling and gathering strength until it howled through our clothes and past us... then subsided slowly into silence. A few moments of complete stillness... then birds began to sing. With the weekend over, guests have left, and our little town has dropped back down to the usual Population 40. But we're never lonely, never alone. When yer tryin' to get yer zen on, but the herd won't letcha.